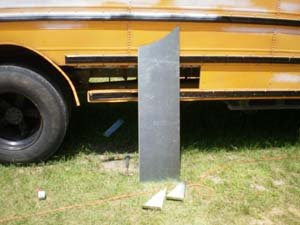 The first thing we did was take the bent up panel from the bus up to the sheet metal shop. I wanted to post some pics of his shop. 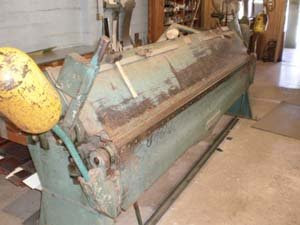 This is the machine that slices through the metal like a hot knife through butter. 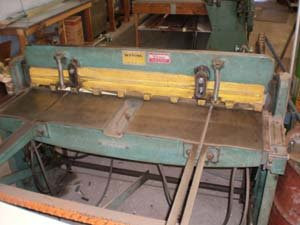 And this is what he uses to bend the metal. 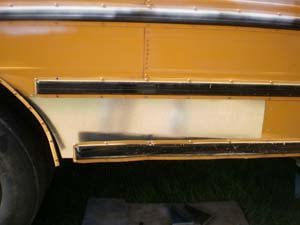 Along with the panel I also left him with a bracket that supported the old panel. I asked him to make me 2 of them. 3 hours later they were ready. Now I was ready to install the panel. It actually took some time to get this panel in place. 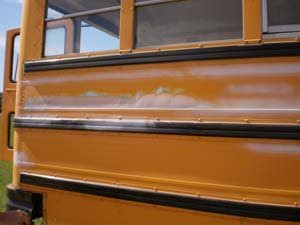 It had to slide up in-between a few pieces of metal on the bus. With a bit of effort the piece went in. I ordered 2-50 count boxes of 1/4" dome head rivets with a grip range of .080" - .375". 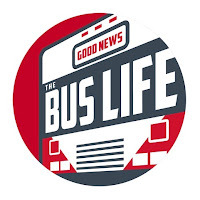 These should match the bus's rivets exactly. They will be here on Thursday. 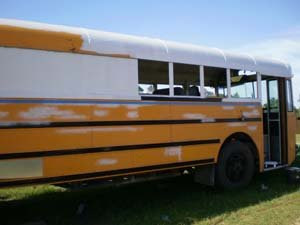 After we installed the panel I finished prepping the passengers side for paint by doing some last min. 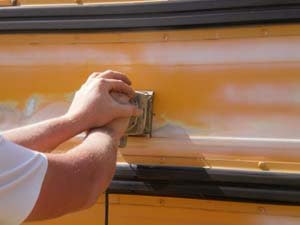 sanding, scraping and cleaning of the surface with paint thinner. Now the roof has already been painted. (still needs one more coat). We are now using some smaller foam rollers that we found at Lowes. These seem to make an ok finish and gives it a more sprayed on look. 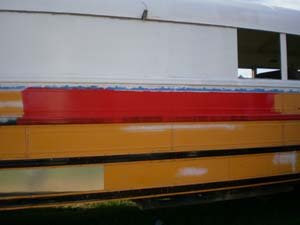 We decided, after much contemplation, to go with red on the bottom portion of the bus. 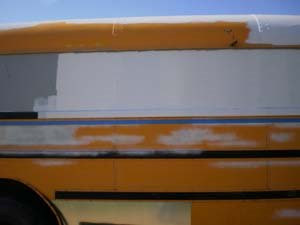 After it is finished it should look really good. 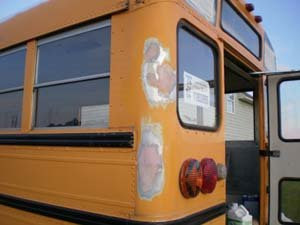 I did not get the whole side done because of the panel and the Bondo work I am still doing. 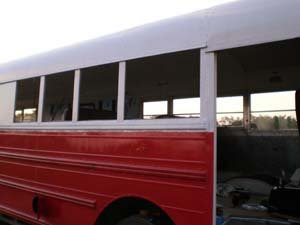 I would say that we got about 3/4 of the passenger side painted today with its first coat. Still have a lot to do though before even this side is finished. 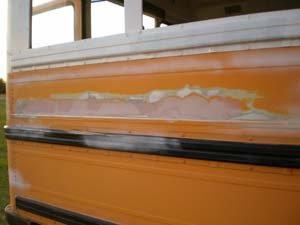 Through out the day I was working on the Bondo on the rear of the bus. 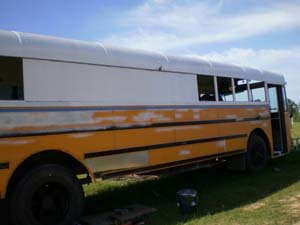 This hopefully is the final coat. Should be able to sand it tomorrow and be done with it.